What is the lowest temp. 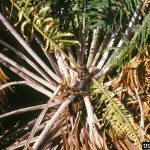 a sago palm can live in? I have one that is so big I can't move it. These plants are generally quite hardy, surviving to 20 degrees F.